Percy Kelly was born in 1918 at 113 Corporation Road Workington. His family were poor. His father Oscar was a Manxman carpenter; his mother Martha was a Scot. He was one of seven children (a twin) living in a small terrace house with Martha’s father Hugh. It was a devoutly religious household. He could draw as soon as he learned to hold a pencil. 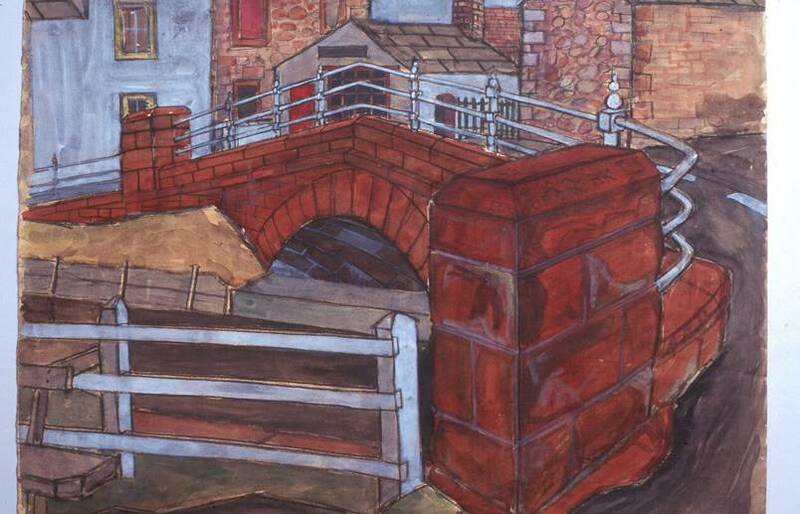 Until the age of eight he lived close to the docks in Workington and he wandered freely, drawing boats, engines, trains, cranes and clumps of flowers. 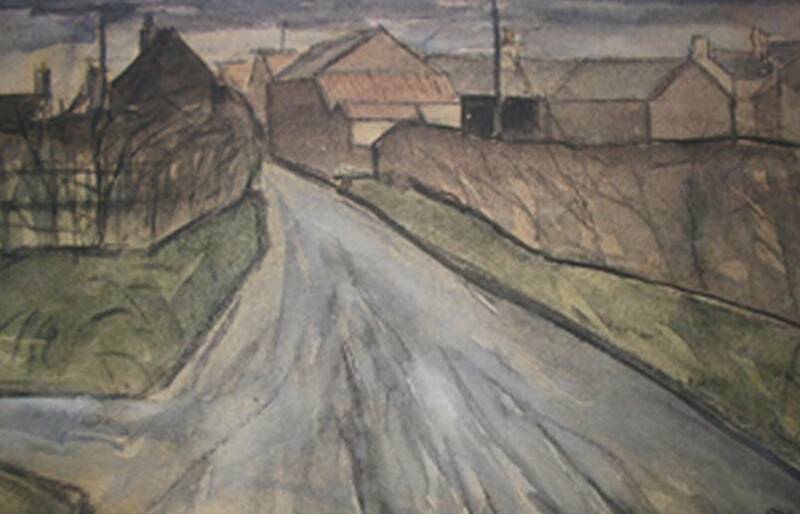 In 1928 when he was 10 the family moved to Salterbeck a few miles south of the town centre but still on the coast and within reach of Harrington harbour which he drew and painted. It was then that he began to walk longer distances inland and discovered the western edge of the English Lake District. However the pretty and conventional didn’t interest him. He always returned to the strong black lines and dark vistas of the coast, the mining villages, pit heads and railway lines. Once at school his father was approached several times by teachers who advised his son should go first to grammar school and then to art college. In the economic circumstances this was impossible. Throughout his life his extraordinary talent was quickly noticed. His ability to draw gained the attention of Sir Winston Churchill, Lord and Lady Webb, Lord and Lady Eccles, Sir Nicholas Sekers, Princess Margaret and her husband Anthony Armstrong Jones and many more. Important people befriended him and tried to help him. Prestigious galleries pursued him but few succeeded in nailing him down to exhibit – Andreas Kalman at Crane Kalman in London: Mike Goldmark at Goldmark Gallery in Rutland: The Stone Gallery, Newcastle upon Tyne: Geoff Green at Tib Lane Manchester: Agnews of Bond Street and many more failed. He was 48 when his patron Sir Nicholas Sekers gave him his first exhibition at Rosehill Theatre and then at his showroom in Sloane Street. Lady Fermoy at her Gallery in Kings Lynn and Mary Burkett at Abbot Hall in Kendal were the only others to succeed but then only once. He was difficult to deal with, vacillated, cancelled and constantly changed his mind about what he was prepared to exhibit or sell. His marvellous friend and correspondent of his last 10 years, Joan David arranged a private exhibition at the house of her friends in Troutbeck in 1984 to pay the alimony on his second divorce. These few exhibitions were undertaken reluctantly and through necessity. Kelly died intestate and in self imposed exile in Norfolk in July 1993. His estranged only son Brian inherited by default. Neither he nor those living around him had any idea of the value of the work which haphazardly filled every space in his small cottage. Due to the persistence of his faithful friend Joan David of Kendal the work was saved and brought back to Cumbria where Chris Wadsworth owner of Castlegate House Gallery in Cockermouth photographed and catalogued every piece. On the instruction of Brian Kelly, these were sold in 5 sell out exhibitions at the gallery. Sadly Brian died in the last of these shows. Since then many more collections of Kelly’s work have been discovered and have formed further exhibitions primarily at Castlegate House and Messums in Cork Street London. Frightened of losing his supplementary benefit, he secretly stashed away parcels of choice work which he posted to friends and relatives to keep them safe and then forgot about them. As his fame spreads these have come to light - one collection in its original unopened parcel on top of a wardrobe was postmarked 1984. The recipient was asked to look after it for him. She had. Kelly’s work is linear, graphic and simple. It has universal appeal. 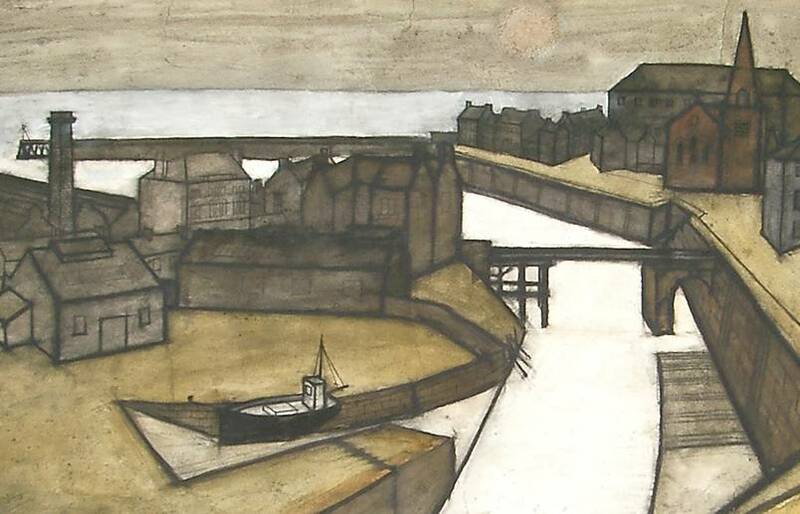 His charcoal drawings of the industrial coast of Cumbria made between 1958 – 1968 are unmatched in quality. Andrew Lambirth writing for The Spectator described Kelly as a ‘Troubled Genius’ and Blake Morrison writing in The Guardian compared him with Lowry, Sheila Fell and Rousseau. Although Kelly left West Cumbria in 1970 to live first at Levens near Kendal, then in Wales and finally in Norfolk, his heart was always in Cumberland. He was a prolific letter writer which seemed to assuage his endemic loneliness and depression. 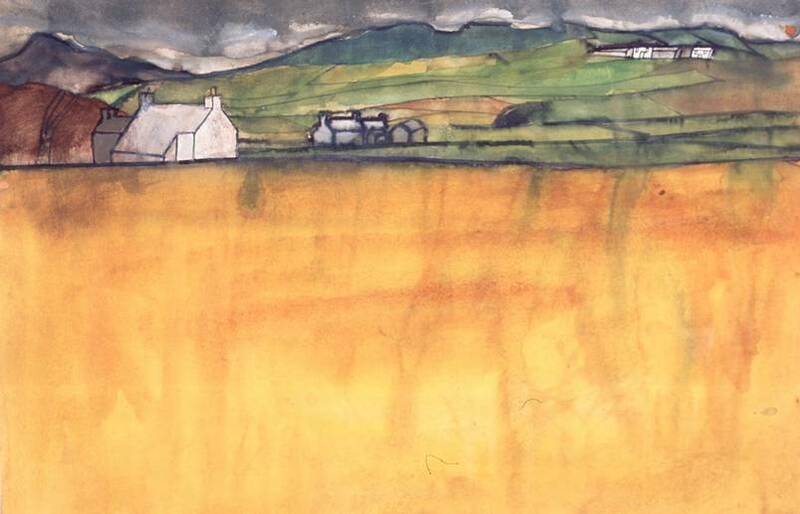 Many of these letters were superimposed on drawings and paintings of his native county. 1956 - 1958 Had a breakdown. Took up Yoga. 1958 Gave up the post office and moved to Allonby on the Cumbrian coast. 1961 - 1965 NND in Lithography & printed textiles at Cumbria College of Art. 1971 His wife Audrey divorced him. 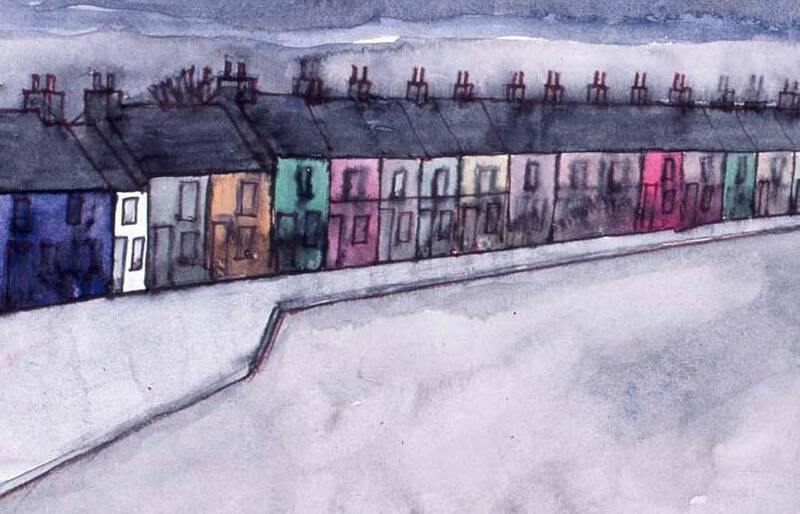 Lived in Whitehaven with Chris Griffith. 1972 Moved to Levens Park Cottage and married Chris. 1983 Chris left him and applied for a divorce. 1984 Exhibition at Cringlemere Troutbeck to pay debts for the divorce. 2000 His son Brian died during this exhibition aged 53. 2005 Exhibition of his letters at Theatre by the Lake Keswick. 2007 Exhibition of sketch book work at Theatre by the Lake Keswick. 2013 Launch of Percy Kelly Trails in West Cumbria.